Today we have a very pretty card from Sheree. Today's card is a rather simple and quick card made using some of the newest Spellbinders and BLING-abilities. Leftover crystals from partly used elements. When working with the BLING-abilities I sometimes overlap elements which would mean hiding some of the crystals. Rather than doing this I remove these spare crystals and keep them for using as single crystals on other projects. 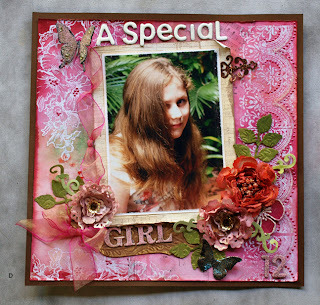 Today's project is a cute layout from Teresa. Welcome to Tutorial Tuesday. Today we have a step by step for enamelled butterflies. 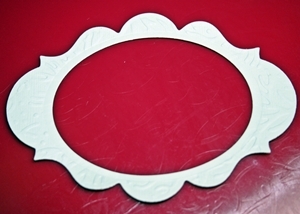 Cut Butter flies from thin chip board. 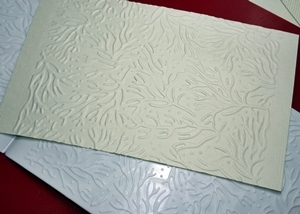 Dab embossing fluid all over the chip shape. 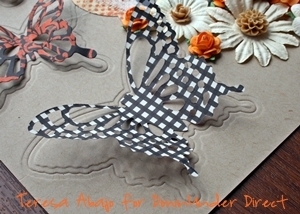 Sprinkle embossing powder all over shape. Remove excess. Heat the powder with a heat gun. Use a skewer, to hold in place and move enamel around, if needed. Sprinkle a little black embossing powder around the edges, and heat with heat gun, use the skewer to swirl the black into the pink embossing powder. Allow to cool, they are quite hot, so don’t burn your fingers. You can add glitter or micro beads, when the embossing powder is hot. Use the skewer to cover areas, that have missed a bit of powder If you don’t like the look of the butterfly simple reheat and add more product, or swipe it off with the skewer. There are no mistakes, they all can be fixed. Use the skewer to make swirls and patterns in the enamel. Make a lot up an one time, so you always have them on hand when doing a project. Have fun and experiment. "This is a tiny little concertina book. 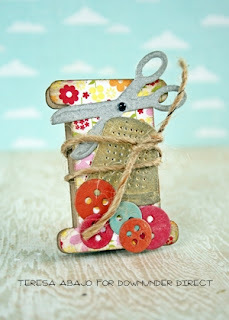 The covers were made with the bobbin die from the new Spellbinders Sewing Elements set of dies, and decorated with various other shapes from the set. Aren't the scissors just adorable?" Today we have a mini tutorial for making a patchwork themed card. "The temptation to make a punny sewing theme card was too great, and I gave in. 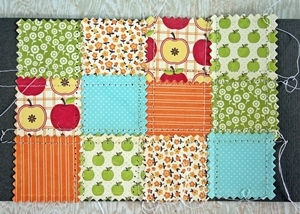 As much as I love the look, paper patchwork is about as close as I'll ever come to quilting!" 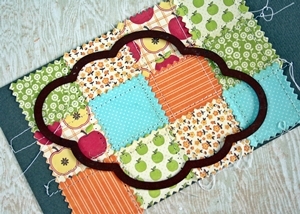 Cut lots of little shapes using a die from the Square Swatches set and some bright colourful paper with small patterns. 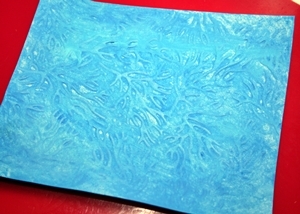 Adhere them to a scrap of cardstock (it doesn't matter what colour this is, as it will be completely covered). 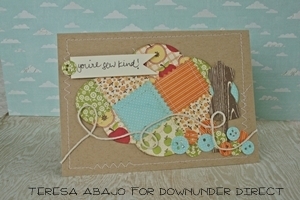 Once glued down, I added some stitches with my sewing machine to give extra texture to my finished card. Cut a shape using a Labels Six die. I set mine on an angle for extra interest. "Using plain card is vital to creating a good Stamp Resist technique, emboss with clear embossing powder on white card and then ink or spritz with colour, and you have created your own patterned paper." 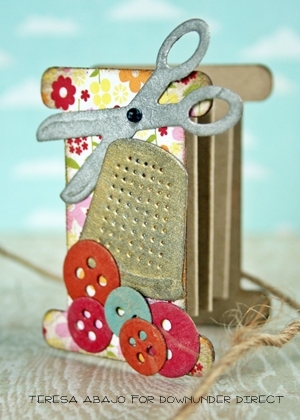 Here is a cute idea for a pin cushion. This time the BLING-abilities have been adhered to some felt rather than cardstock. 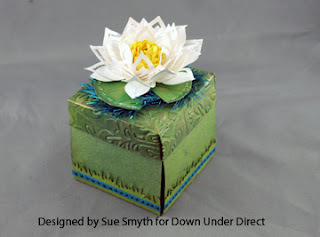 "This pincushion was a lot simpler to make than I thought! 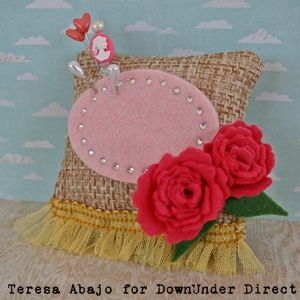 It’s simply a little pillow stuffed with hobby fill, and decorated just a little with glued and hand-stitched embellishments. I had fun making some of the embellishments with felt, and BLINGabilities are always fun to work with. This pincushion will hold some of my pins, so that they’re not put away in a box and hopefully I’ll remember to use them a bit more in my work." 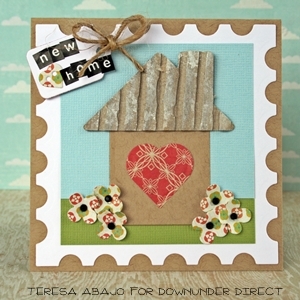 "I can see this new Home Sweet Home set becoming a fast favourite. There are lots of little shapes here, including a couple of cute tags, buttons, wings and hearts, making it very versatile." 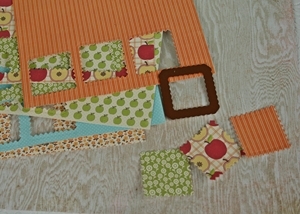 Today we have a project for a Kitchen Tea Invitation. Here are a couple of cards I made using Angle Approach. 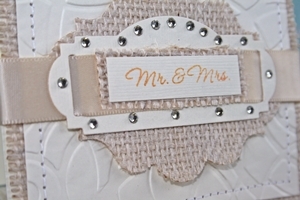 I've used doublesided cardstock for extra effect aswell as added a little bling. "I love the lacey look of the Spellbinders Cut, Fold & Tuck dies, they make wonderful focal points for a card." Today we have another lovely layout from Sheree. "This card shows yet another way to use Rose Creations to make a professional looking flower, this time I have spritzed and twisted the petals together to give a spiky look." Today we have a step by step from Teresa. 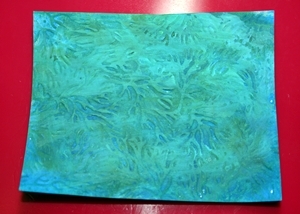 The combination of acrylic paints, distress inks and embossing makes for interesting textures. 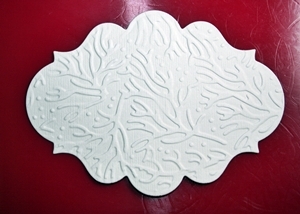 Emboss a piece of cardstock (the colour is not too important, as it will be covered up with paint) with the new Sea Beauty M-Bossabilities plate. 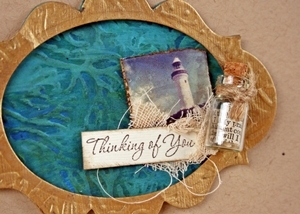 Cover the entire piece with a couple of different shades of blue paint. Once dry, add a couple of shades of green paint. Spray lightly with a dark green colour spray (eg Forest Green Glimmermist), and allow to dry. Sponge some dark green ink over the painted cardstock to bring out the detail of the embossing. Emboss another piece of cardstock, and cut using a Labels Twenty die. 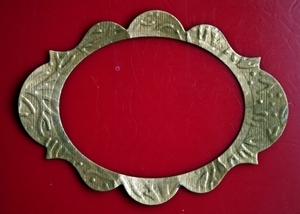 Cut the centre out of the shape with an oval die, thus making a frame. 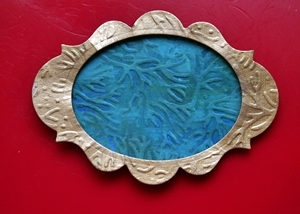 Paint the frame with gold acrylic paint, and when dry, sponge some dark brown ink to bring out the detail of the embossing. Using the same Labels Twenty die we used to make the frame, cut a shape from the painted piece of background, and attach it to the back of the frame with mounting tape. At the bottom right of the frame, adhere some tea-stained gauze, the mini corked bottle and the image. 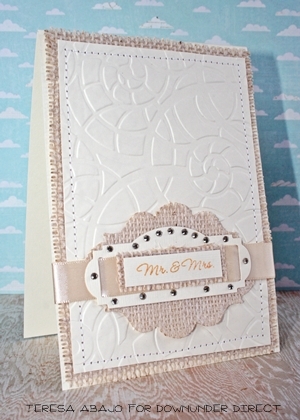 Stamp the sentiment onto French Vanilla cardstock, trim, and adhere to the card. 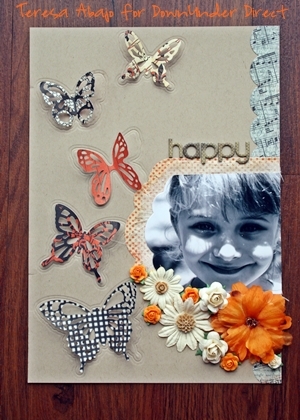 Here is a layout I made using various elements from the new Cut,Fold and Tuck dies. 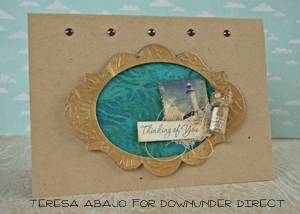 These new dies are particularly effective when using double sided card stock such as the WorldWin I've used here. 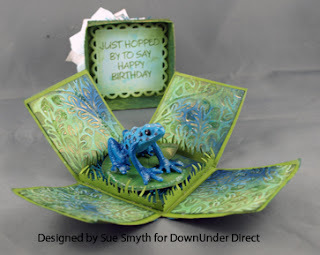 "The Anemone Flower die makes a beautiful Water lily, so for a friend's birthday I made this froggy box as she loves frogs." 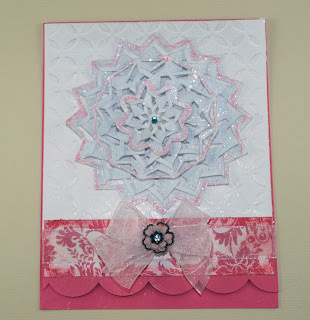 The Design Team is loving using the new BLING-abilities, and today we have another card featuring this fun new product. Today we have a layout featuring Tear Drop Circles BLING-abilities. Today we have another project using the new BLING-abilities. 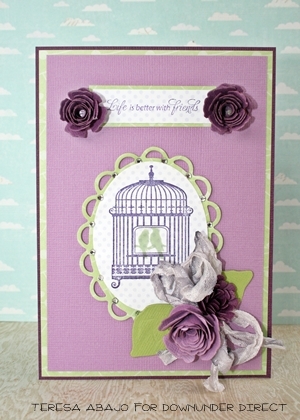 Today's project is a card I made using Grand Dahlia. I really love this particular die as I'm finding it very versatile. With a few folds and a simple cut you can overlap the petals to make a simple dimensional flower. 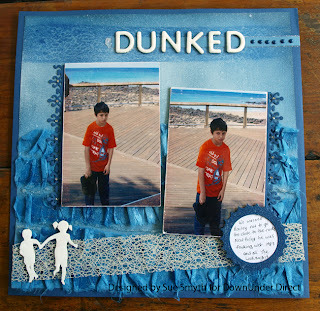 Today we have a masculine themed layout from Sue. "I love the look on number 2 son's face after he fell in, he was warned, only to end up soaking wet with a drowned MP3 player, which is what he is most upset about, that and his pride!" Today we have an Off The page project to share with you. 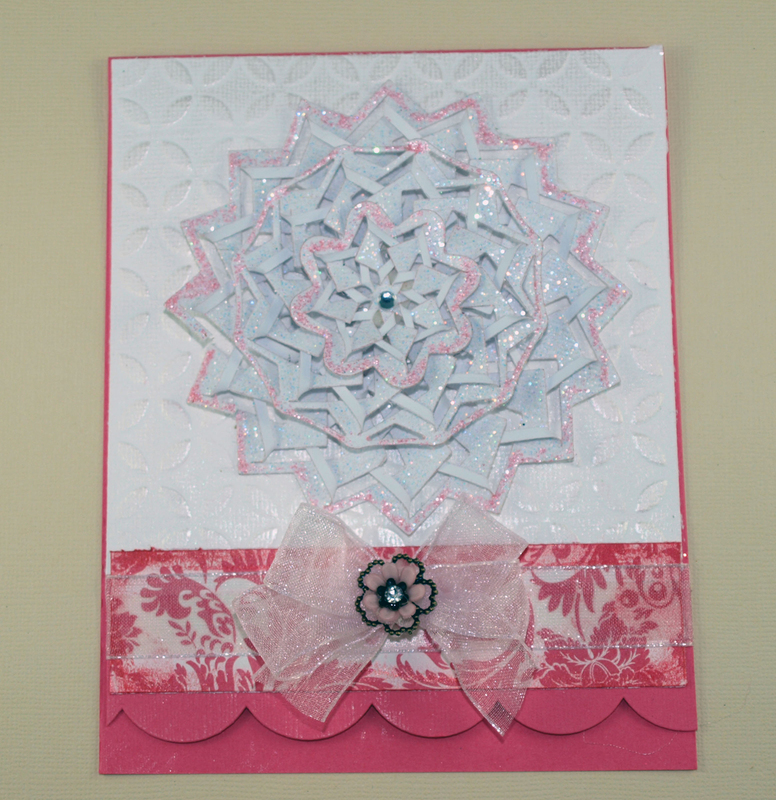 This project features one of the new Cut Fold and Tuck dies- Spectacular Spin. 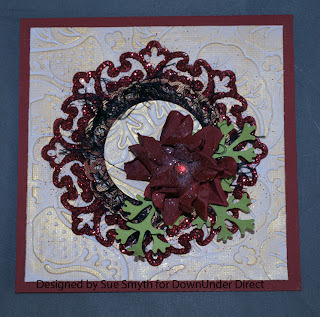 To give the project that something special, Sheree has used some BLING-abilities as well. Today I have a Disney layout to share. Today we have an A4 sized layout, with the butterfly silhouettes from the Wonderful Wings set embossed directly onto the base card. The Grand Calibur is big enough to take the whole A4 sheet.